Friday 19th and Monday 22nd April. We re-open on Tuesday 23rd April at 9.30am. Please find below the notes from a recent A46 Expressway meeting held in Billesdon Coplow Centre on 4th April. We are pleased to announce that the defibrillator has now been installed in an external cabinet at the Recreation Ground. A light above the defibrillator will be fitted shortly. Elections - Are You Registered to Vote? Please find attached the Notice of Election for the Councillors of Great Glen Parish. Please find attached the Notice of Election for Glen Ward for the election of Councillors. 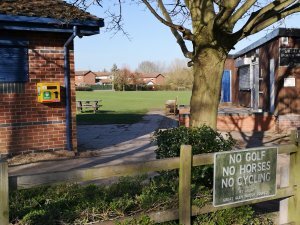 Harborough District Council has just introduced state of the art play equipment at play areas in Fleckney, Great Glen (Cromwell Road) and Market Harborough – with play areas in Lutterworth and Broughton Astley to be revamped later this year. Miller Homes Oaks Road Reserved Matters Application is REFUSED!! The Reserved Matters Planning Application for 170 houses on Land north of Oaks Road by Miller Homes has been refused by HDC at a recent planning committee meeting. Please note that the defibrillator has been removed from the Post Office and is temporarily situated at the Parish Office. We are currently in the process of refurbishing the equipment and obtaining a weatherproof cabinet. It will then be relocated to the Recreation Ground. When it is installed there we will let you know. There is another defibrillator located outside the Co-op on Main Street.